Trader Joes is my happy place. I may be one of the few people that actually enjoys grocery shopping; I like to take my time and explore every aisle. Over the last year or so, trips to Trader Joes have become a monthly routine for me. There are always new products to try, and I like to replenish my staples. I have had friends tell me that they have no idea where to start when they go to Trader Joes, so I put together a list of all my essentials. A mixture of herbs with a hint of lemon. I use this seasoning for cooking vegetables and meat, it basically makes everything yummy. 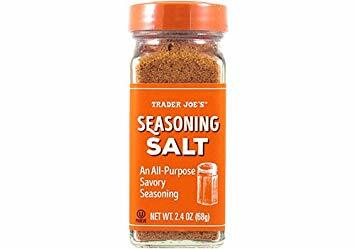 Unlike most seasoning salts, the Trader Joe’s seasoning salt has no artificial flavours or msg. 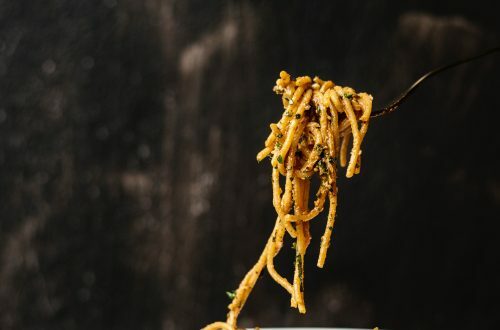 It is an easy way to add a kick of flavour to any dish and amazing on french fries. 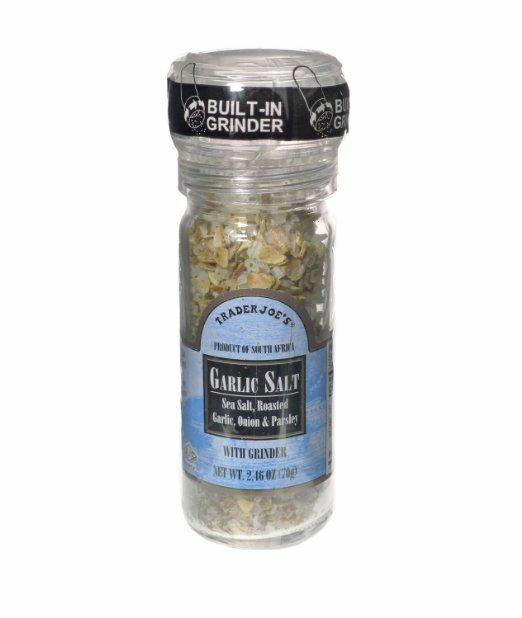 Such a genius inventions, a mixture of rock salts and dried garlic cloves, the perfect companion for most savoury dishes. The mixture of coffee and garlic is surprisingly delicious. 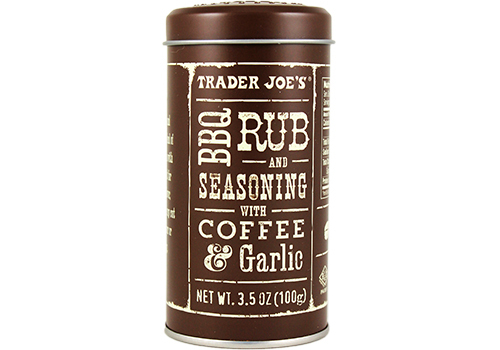 I usually throw this rub on a steak but it is super versatile, I think it would also be nice used on a roast chicken or basically any other meat that you might want to throw on the BBQ. 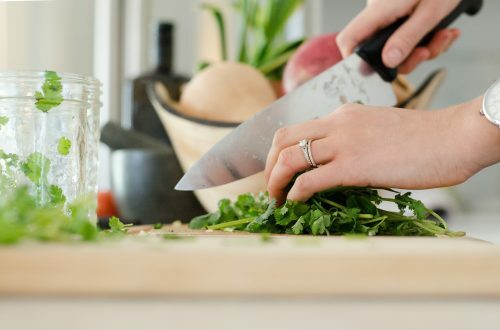 Although I do try to cook every day, something I do need those quick fix meals. 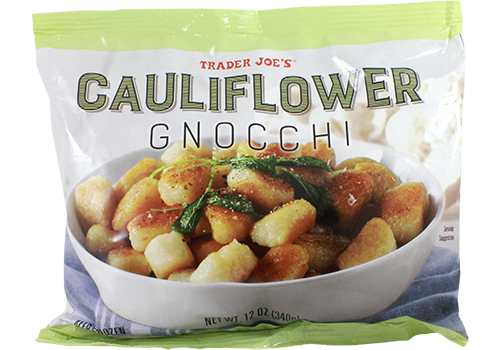 Trader Joe’s has some amazing options that are quick and easy. I have never been a fan of Gyoza so I was surprised when I tried a soup dumpling and I actually enjoyed them. These soup dumplings taste just like the ones I would get at a restaurant. They are super easy to make, I throw them in the steamer for 10 minutes and they are ready to go. Not exactly health food but the perfect hangover cure. I was skeptical about trying this one, but the unusual mixture works. This is my all time fave. First of all, it needs nothing, the gnocchis are coated in a sauce so I can just fry them up. Sometimes I cut up small pieces of bacon or spinach and to throw in, or I add a few prawns but really it is good on its own. 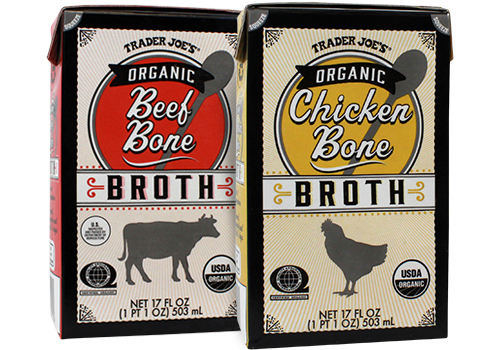 The Trader Joe’s bone broth is affordable and it can be stored in your pantry. Once you open it, it must be refridgerated and used within 14 days. 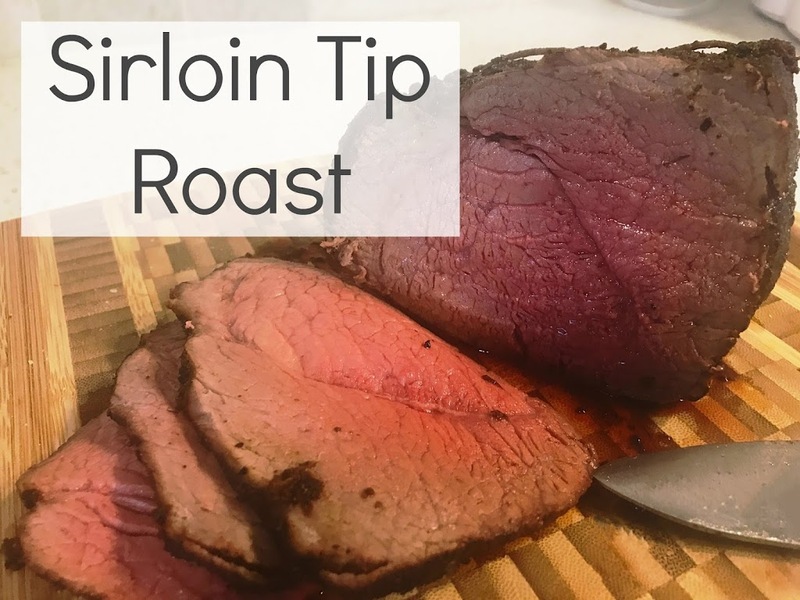 I usually add the broth to rice, mashed potatoes or a stir fry so I can use it up that week. Who doesn’t love dessert? While those people are out there, I cannot for the life of me understand it. My sweet tooth is very real, so it is nice to have something in the house to help curb it. 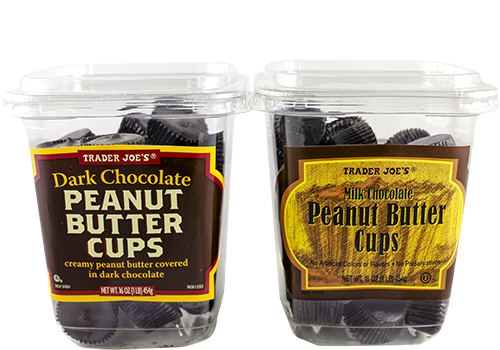 If you like milk chocolate or dark chocolate, Trader Joe’s has you covered. 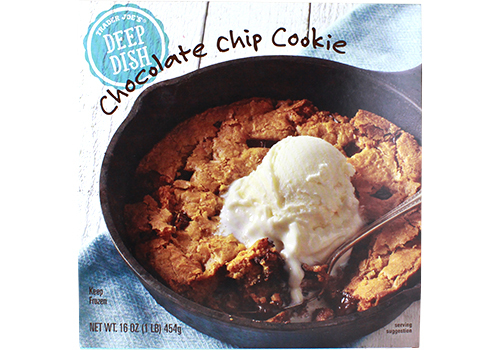 These don’t last long in our home, I like to have something sweet after dinner so this is the perfect quick fix to handle my cravings. OMGGGG! A hot chewy cookie with ice cream on top is the way to my heart. This serving size is quite large so don’t expect to be able to eat this on your own. Also, the ice cream is sold separately. 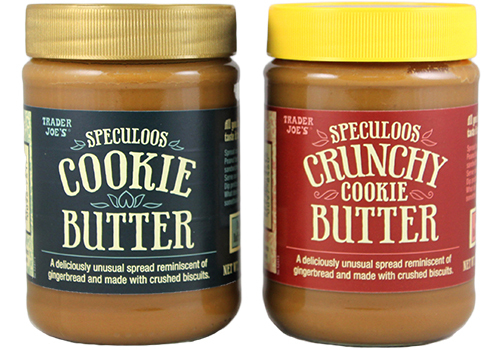 Another cult favourite, it basically tastes like spreadable ginger snap cookies. Although not health food, it is a really nice treat, I usually put mine on apple slices for when I want to have an indulgent snack. The smoothie bowl craze has died down but I am still in love with a good acai bowl. 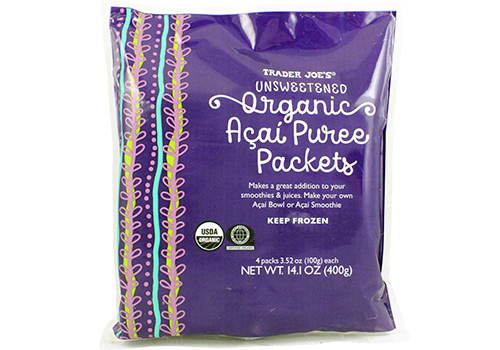 These puree packs are the perfect base for bowls or you can add them to your daily smoothies. To be completely honest, I am not a big juice person, unless it is a fresh cold-pressed juice. Since juice is quite high in sugar, I try to reserve juice for the ‘once in a while’ category. In the winter I drink a lot of tea and in the summer I usually try to prepare iced teas. Green tea is my go-to tea, I find black tea hard to enjoy on its own. Green tea, on the other hand, I enjoy it black, so it’s easy to throw in my bag and bring to work. 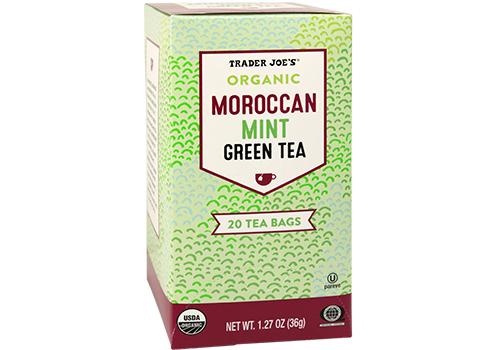 The Moroccan Mint flavour makes this green tea even more enjoyable, it is also one my faves for iced tea. My all-time favourite tea, a mix of green and peppermint tea, the two best teas in my eyes. This one is seasonal and only available during Christmas time so I stock up every year. A life hack for making a peppermint hot chocolate, make hot chocolate and then add in a candy cane green tea bag or peppermint tea bag, the best thing ever! This juice looks so green that you can’t possibly imagine it tasting like anything other than celery juice. The base is pineapple juice so it is pleasantly sweet but filled with green goodness. I hope this was helpful and if you are looking for more grocery shopping tips, I put together a guide for shopping at Costco. 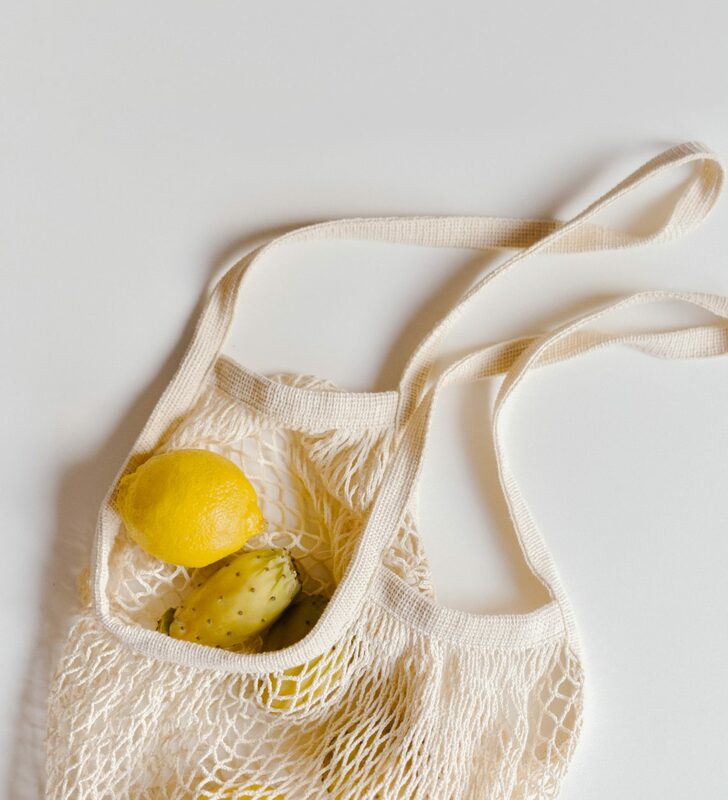 I find that I have to be strategic with what I buy because the quantities are so large, so I break down how I can reduce my food waste. 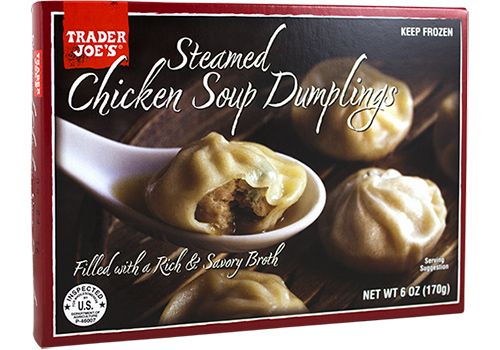 If I missed any of your favourites from Trader Joe’s let me know. I am always looking for new products to try. Leave a comment below, I am sure my readers would like to know as well!